Go on. I'll be here when you get back. There. Wasn't that an amazing record? Sure, the ending is now a little bleak, but, wow, what a powerful, moving and building experience. Sure wish they'd done that the first time around. What's at issue here is that the lyrics and music are in disagreement about what the actual climax of the album is. For Waters, it's obviously the lyrical theme of the underclass (sheep) finally rising up and offing the seemingly dominant class (dogs), but - oh, the irony! - the new revolutionaries set the same patterns of control-through-fear in play. Then he wraps it all up in a bow with a little acoustic number that says that it's all worthwhile because at lease we can love each other on a one-to-one basis. I don't mean to snark, but by insisting on having the pat ending for this album (which is here recycled from Dark Side and will be reused on The Wall, The Final Cut and Radio K.A.O.S.) he doesn't make the stuff that comes before gel - he just diffuses it with a complete 372º turn into "What?" land. And the thing is, the two acoustic numbers here are nice - although it's clear that he's trying his damndest to evoke Dylan - so I can see why they ended up on the record. But even given the insistence on opening and closing with thematically and musically paired numbers (ala Shine On You Crazy Diamond), it's really the order of the songs that come before that end up diluting the message of the album. Musically and lyrically. sung now by Waters, with as much bite and anguish as is humanly possible. And the price that our 'hero' has paid for his years of loyalty and service? Driven by guilt perverted into raging paranoia, he dives into total isolation. Eventually, used up and past his prime, he ends up friendless, heartless and alone in some tropical retirement, finally dying of cancer in the middle of a phone call. It's interesting to note that even though this closing litany is phrased as a series of questions, on the lyric sheet, they're pointedly treated as statements - each one ending with a simple, unalterable period. It's unclear whether the real tragedy of this character is that he's really unaware that he's been controlled all along - but in the end, he has his suspicions. Too late to change, however. In case you can't tell, I think this is an excellent lyric. It pulls off that Waters trick of working at a topic through carefully chosen visual imagery that reflects a secondary, parallel narrative that you have to dig for (appropriate, in a song called "Dogs," no?). I can't remember the exact quote or who said it - Karl Dallas, perhaps? - but Waters had a way of shining a spotlight on clearly-seen moments that still left a lot of ambiguity, largely (and this is my own observation) because he uses a 2nd person narrator often, letting the listener simultaneously identify with but be locked out of the character. Brilliant, really. And the last lines (quoted above), coming as they do at the very end of a lengthy suite of a song, crash in with real force and sadness. And and overwhelming sense of finality. And then, they follow it with three more songs. And the three songs totally lose the thread of the lyrical theme established in Dogs, which takes up most of Side A of the original LP. Pigs (Three Different Ones) immediately goes in for very specific cultural satire, selecting as one target Mary Whitehouse, a self-appointed British crusader for Christian morals in the media, who wanted everything censored that offended her. Well, fine and good for Roger - public moralists are easy targets - but entirely lost on the Floyd fans of every other nation in their audience. Lord knows, for years, I thought it was a reference to the President (who would have been Carter at the time), despite the fact that the printed lyric made "Whitehouse" one word. And do you feel abused? /But you're really a cry. So, we've gone from a devastating portrait of a completely destroyed human soul to - name calling? Again, the lyric is well written - and the song itself is really strong - but it's not only anticlimactic, but a bit odd after the dark humanism of Dogs to find yourself listening to... I dunno, the Rachel Maddow show set to music? And we've gone from the participatory second person voice to the first person. 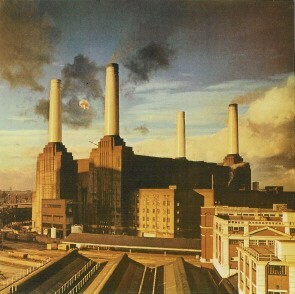 Despite the fact that the primary pronoun in both songs is 'you,' in Dogs it's clear that the 'you' is an internal voice, whereas in Pigs (Three Different Ones), the song is clearly a personal message from Roger Waters to his intended targets. Through pastures green He leadeth me the silent waters by. With bright knives He releaseth my soul. He maketh me to hang on hooks in high places. For lo, He hath great power, and great hunger. And then we'll make the bugger's eyes water. So... blueblood con-men live in fear of crusading moralists? What? And watching for pigs on the wing. Then an externalized shout at the easiest targets - the self-proclaimed moralists and policemen of society. Then, a hazy dream of all of those with who we share our daily grind rising up and creating a new utopia... which of course, turns out not to be a utopia at all, because of human nature being what it is. Then, in the end, we're left with a stark reality of the scared and empty lives we've built around ourselves - and a warning to be aware most of all of how you comport yourself. Because, even given the external oppressions we face, our most subtle and dangerous adversaries are ourselves.